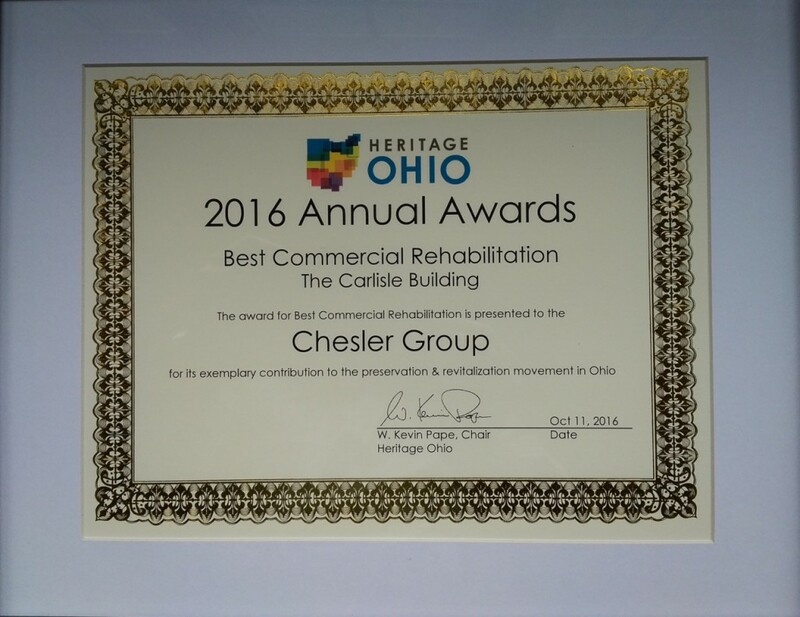 The Carlisle Building was honored as the 2016 recipient for Best Commercial Rehabilitation by Heritage Ohio. The award was presented to Chesler Group, our project architect Schooley & Caldwell Associates and Adena Health System, our tenant. People often look at historic buildings and declare “it’s too far gone, it can’t possibly be saved.” The Carlisle Block Building, located in the heart of downtown Chillicothe, Ohio was such building. This prominent landmark had survived a serious fire in 2003, a nearby subterranean water main break, several failed renovation attempts, and 11 years of condemnation and being open to the elements. The results of this neglect included a rear wall that had collapsed into the basement, taking out a portion of the floor structure; an incomplete roof structure; a dormer that was still moving away from the building; and foundations that had been washed away under major loadbearing masonry walls, resulting in cracks large enough to stick your arm through. 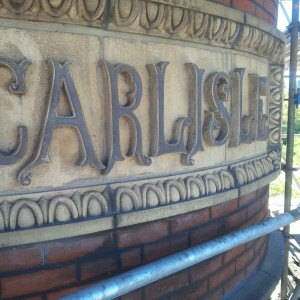 If there was ever a building ‘too far gone’ Carlisle represented it all. The team’s commitment to preserve and protect the Carlisle involved exacting attention to detail using modern construction techniques blended with “old work methods.” The project utilized both Federal and State Historic Tax Credits, with a total project cost of approximately $10MM. Moreover, it is the first project accepted into the JobsOhio Revitalization Program, which focuses on projects that benefit local and state economies. It is a fine example of how historic tax credits and other economic incentives contribute to saving our history. Importantly, the reconstruction and restoration of this iconic historic structure has been a catalyst to aid the revitalization of Downtown Chillicothe and its surrounding community. In fact, since the completion of the Carlisle project at least three more Downtown development projects have been in the works. Carlisle’s success story has strengthened confidence in the City and serves as a reminder that historic main streets greatly benefit from collaborative efforts to preserve and maintain the past for our future. 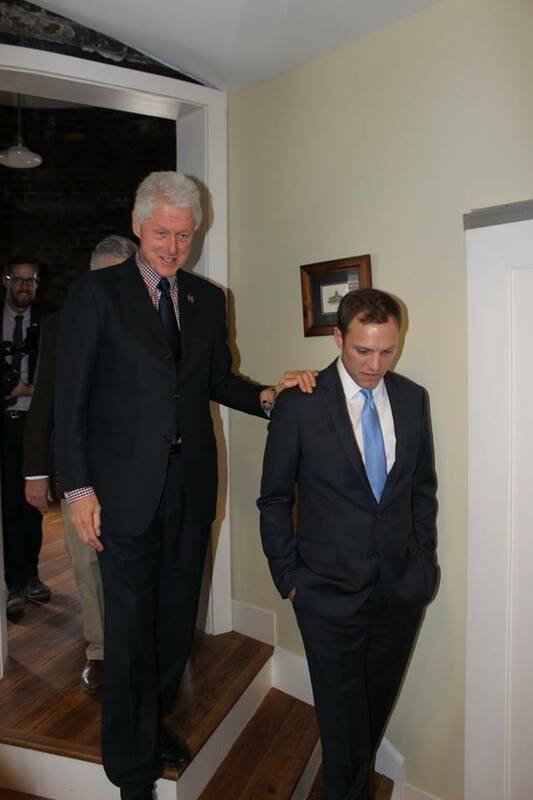 Former President Clinton paid a visit to Chesler Group’s latest historic rehabilitation project, The Carlisle Building, yesterday, March 9, 2016. 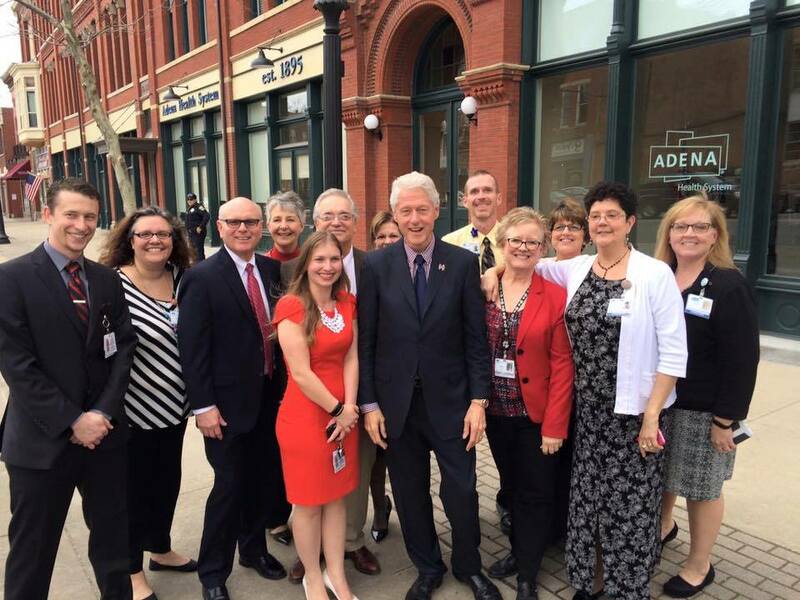 Clinton toured Chillicothe’s, Ohio most prominent landmark, which just recently has been restored to its old days’ glory by Chesler Group. 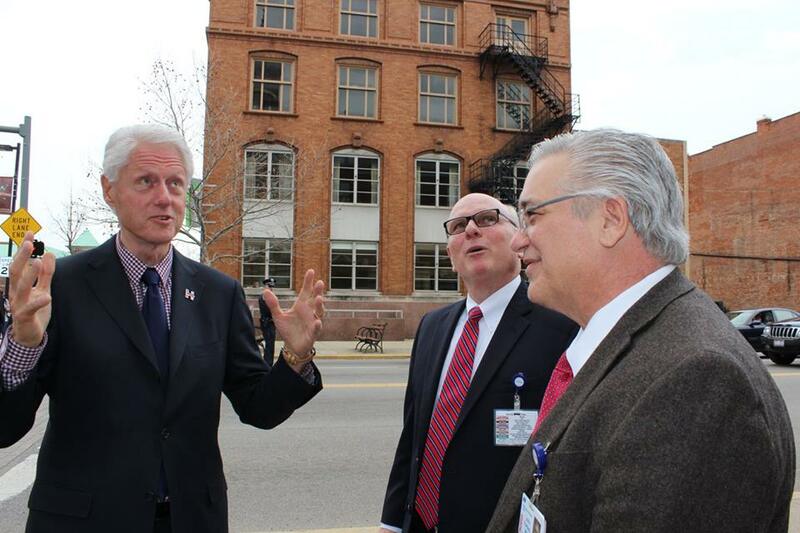 Clinton met with Chesler Group’s tenant Adena Health System and Chillicothe’s Mayor Luke Feeney and enjoyed the story of Carlisle’s amazing transformation. Clinton emphasized the importance of the Federal historic tax credit program for historic restoration projects, which he supported under his administration and continues to do so. 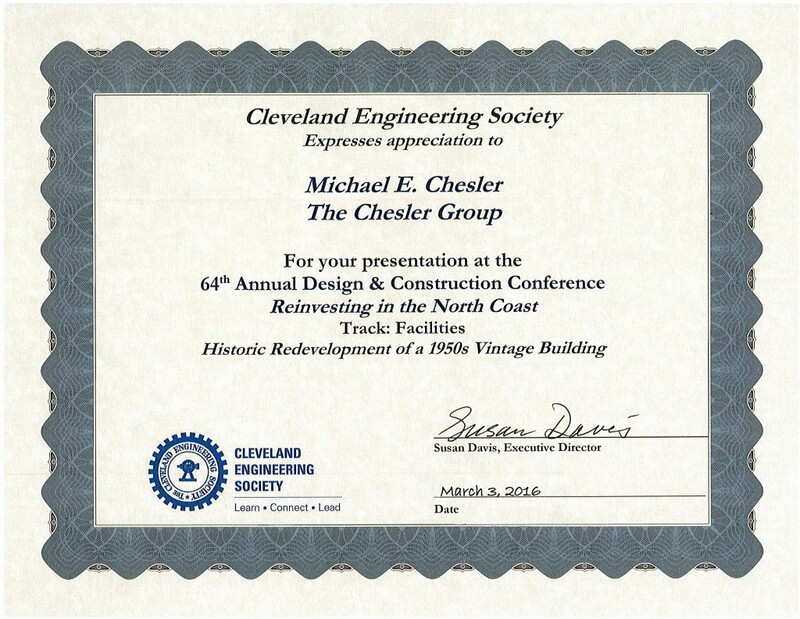 Michael Chesler presented as a guest speaker at the 64th Annual Design & Construction Conference and Trade Show Hosted by the Cleveland Engineering Society on March 3, 2016. He talked about the standard thinking, challenges, and enjoyment of 19th century architecture and juxtapose this with the ASM restoration of a historic, Modern building, which broke all the rules and caused us to rethink what a historic building is and how it should be renovated. The terms “historic building” and “historic redevelopment” come with a clear image of a 19th century brick and masonry building. From an engineering perspective, these buildings were well constructed using local materials and smart, stalwart engineering techniques. Block and tackle, horses, hand tools, and significant amounts of man power were deployed to raise the structure. Most of the engineers in this room have worked on these buildings and have varying degrees of interest, experience, and success with these projects. In 2012, The Chesler Group, Inc. undertook the complete restoration of a Modern, 1950s vintage building that was listed in the National Register of Historic Places as the youngest historic building in the USA undergoing a “historic” rehabilitation. There were no rules at the National Park Service as to how to manage the renovation of the materials, glass, steel, and specialty elements. In fact, the two materials that were considered the most sensitive and “historic” were concrete and glass and the latter is in very short supply in the typical 19th century building. 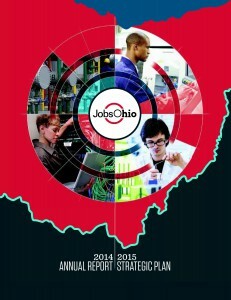 Our Carlisle project has been featured as “First JobsOhio Revitalization Program Project Success” in its 2014 Annual R eport released March 2, 2015. The state’s nonprofit economic-development agency provided a low interest loan in the amount of $1MM in support of the historic rehabilitation of Carlisle, the most prominent landmark in Chillicothe, Ohio. Glorious changes to an iconic symbol of Chillicothe, Ohio. The historic tower of the Carlisle Building has been wrapped in scaffolding and all its structural elements, completely destroyed by fire over a decade ago, have been meticulously replaced. 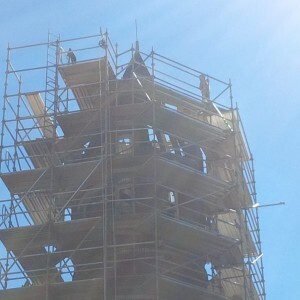 New lumber and sheeting materials will exactly replicate the historic tower roofline, and new flashing and shingles will be added to ensure the tower will last another 100 years. A cutting-edge, high-tech drone cam was used to capture aerial views of the Carlisle construction project. This video gives a cool and unique perspective of the iconic Carlisle Building in Chillicothe, Ohio as it undergoes a complete $10 million renovation. Significant visual changes since rehabilitation work started in June are showcased in great detail. The Carlisle shell and core has been completely stabilized and the non-historic storefronts and rear additions have been surgically demolished. Interior framing and masonry restoration are underway. In the upcoming months the mansard roof and decorative dormer will be restored and the 75 foot tower will be stabilized and tuck-pointed. Stay tuned – more to come in our Fall newsletter!! 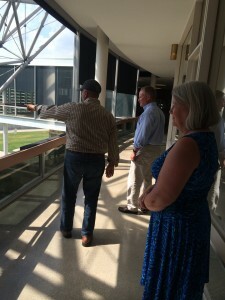 The Chesler Group hosted a tour of the ASM Complex for US Representative David Joyce this past Friday, September 5, 2014. The Congressman was joined by Mariangela Pfister, (Dept. Head & Deputy SHPO for Technical Preservation Services, State Historic Preservation Office); Amanda Terrell (Director of Ohio’s State Historic Preservation Office at the Ohio History) and Joyce Barrett (Executive Director at Heritage Ohio). 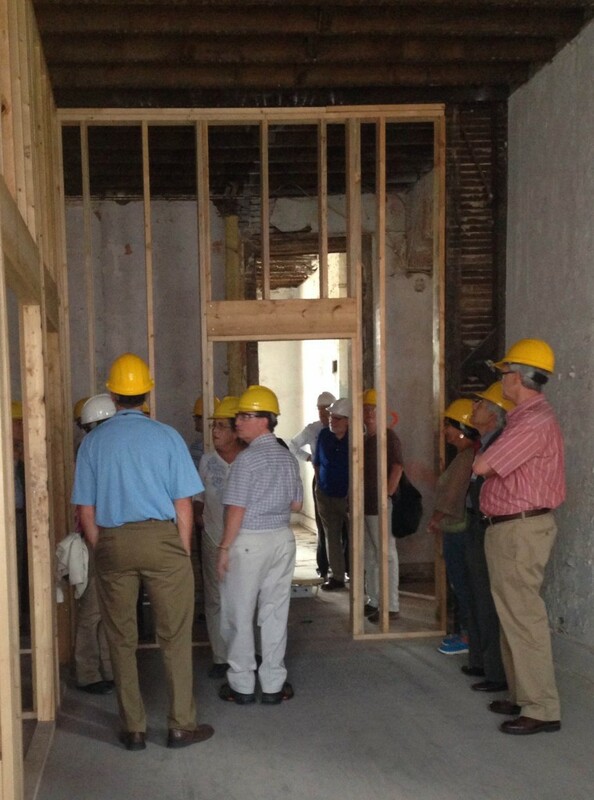 The visit highlighted the importance of both the Federal and State Historic tax credit program for historic rehabilitation projects. Michael Chesler emphasized that without the ability to syndicate historic tax credits, the renovation of the ASM Headquarters would not have been financially feasible. ASM had planned to sell the unique Mid-Century masterpiece and move its offices to Chicago – a loss of over 150 jobs for the Ohio region. Therefore, the continued support by Congress of the Federal Historic Tax Credits is critical to preserving America’s history. Recent IRS provisions and rulings have paralyzed the tax credit industry and greatly limited the financial resources needed to complete historic projects. Michael Chesler, Congressman Joyce and Joyce Barrett (Heritage Ohio). 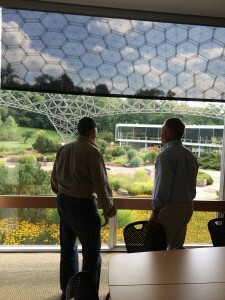 Congressman Joyce and Michael Chesler enjoy the view into the Mineral Gardens. Earlier this week, the much anticipated construction kickoff event was held for the renovation of the Carlisle Building in Chillicothe, Ohio. The Chesler Group is restoring the building for the Adena Health System and will house offices on the first floor with residences on the upper floors to support their new medical education program. The event, hosted by the president and CEO of the Adena Health System, Mark Shuter, brought business and community members together to celebrate the already drastic transformations that are taking place on the corner of Main Street and Paint Street in the city’s downtown. The afternoon began with Adena Health System board members touring the construction site and finished at the Cross Keys/17 Restaurant, where the many people who helped bring the project to fruition were recognized. JobsOhio, the Ohio Development Services Agency, The City of Chillicothe, Cortland Banks, The Chillicothe-Ross Community Foundation, and the Appalachian Partnership for Economic Growth have all lent invaluable support to the project. Shuter described the project as being the “biggest show of community involvement” in his career. Work on the renovation of the historic Carlisle Building is underway with some interior demolition and the installation of utilities at the structure. Jeff Klecka, construction foreman with the Chesler Group, said Wednesday that crews were performing demolition inside in addition to putting in electrical and water lines at the site. 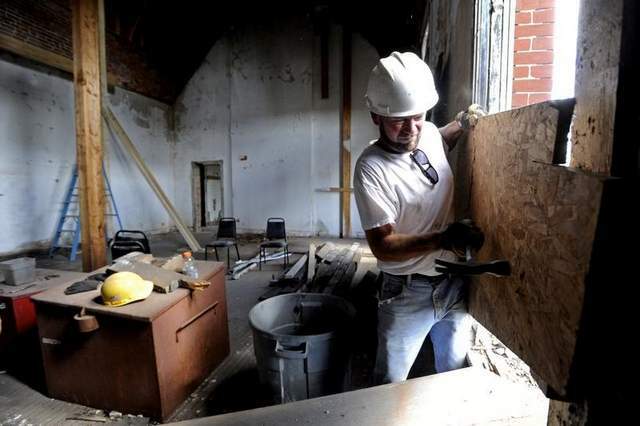 “Within a month, they’re going to start tearing down the back,” Klecka said. Scaffolding work is expected to begin next week at the building as part of renovations being led by the Cleveland-based Chesler Group, with a target reopening date in fall 2015. Adena Health System will be the main tenant, using the space for offices and living space for medical students. The developer of the building, Michael Chesler, closed on the building last month and signed a 15-year lease with Adena in February. The downtown landmark has stood unoccupied since a 2003 fire damaged it. 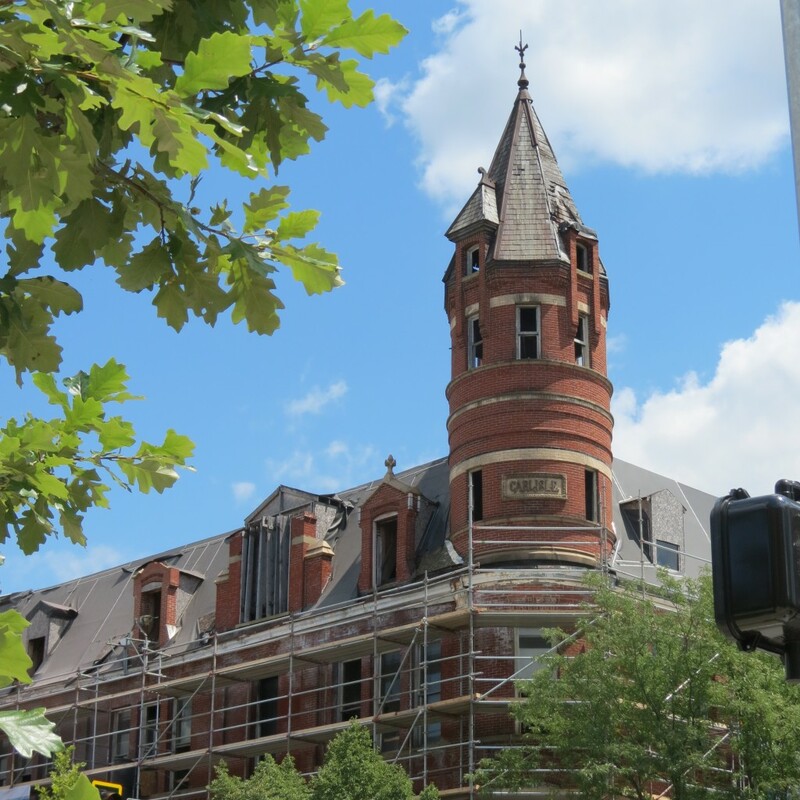 Several efforts have been launched to renovate the structure in the years since the fire, but none gained any traction until the partnership between Adena and Chesler was formed. Sidewalks surrounding the Carlisle are blocked off because of the ongoing work, which could cause minor delays for motorists because of construction vehicles in the area. Chesler previously told The Gazette that stabilization efforts involving the Carlisle were estimated to take four to six months. Residents and visitors in Chillicothe, Ohio, may have noticed changes downtown over the past week. The Chesler Group. Inc, has begun erecting scaffolding along the historic Carlisle Building, the start of a $8 million preservation and rehabilitation project. This prominent Chillicothe landmark was condemned after a 2003 fire. The Chesler Group will restore the building to preserve Chillicothe’s history, provide new residential and office space, and support the rejuvenation of downtown Chillicothe. The Carlisle was built in 1885, a Romanesque Victorian with four stories of office and retail space and a distinctive round tower overlooking the corner of Main and Paint Streets. The Chesler Group will renovate the Carlisle into space for the Adena Health System, the major provider of health care in south-central Ohio. The first floor will house Adena offices, and the upper three floors will be converted into 32 residential units for graduate residents and medical students. These new residents will support the many local retail businesses just steps away from the Carlisle along Paint Street and Main Street. The Carlisle Building is an important component of the historic Chillicothe Business District, and The Chesler Group will use Federal and State historic preservation tax credits as well as a JobsOhio grant and subsidised loan to finance the project. These incentives place exacting standards on the quality of the renovation, and guarantee that The Chesler Group will preserve and restore all of the historic interior and exterior features which make the Carlisle such a distinctive building. The Carlisle Building is expected to be ready for occupancy in fall 2015.